Series of compelling public service announcements for drug education that provides a comprehensive look into the true and devastating dangers of the most popular drugs, from marijuana, alcohol, opioids and synthetic street drugs to the highly addictive pharmaceuticals marketed with multi-million dollar advertising campaigns and targeted at adults and schoolchildren all across America. "They said drugs would make you cool... They lied." Over 11 percent of students tried marijuana before the age of 13. Factual information on drug abuse can save lives—a public service message. “They said I wouldn’t get hooked after the first hit… They lied.” Factual information on drug abuse can save lives—a public service message. "They said Ritalin would help me focus... They lied." Ritalin is highly addictive and is classified by the United States Drug Enforcement Agency (DEA) in the same category as cocaine. Factual information on drug abuse can save lives—a public service message. "They said prescription pain killers were totally safe... They lied." In the United States, more than 15 million people have abused prescription drugs—2 million of those addicted are teenagers. Factual information on drug abuse can save lives—a public service message. "They said heroin would be the best high I ever had... They lied." Between 1995 and 2002, the number of American teens aged 12 to 17 who used heroin at some point increased by 300 percent. Factual information on drug abuse can save lives—a public service message. "They said weed wouldn't lead to harder drugs... They lied." Of adults 26 or older who used marijuana before the age of 15, 62 percent went on to use cocaine; 9 percent went on to use heroin; and 54 percent went on to nonmedical use of psychopharmaceuticals. Factual information on drug abuse can save lives—a public service message. "They said synthetic drugs would give me a safe high... They lied." Calls to poison control centers related to synthetic marijuana use increased in the United States by almost 80 percent between 2010 and 2012. Factual information on drug abuse can save lives—a public service message. "They said if I got drunk, I'd be one of the guys... They lied." An estimated 7,000 people under the age of 21 die each year from alcohol-related injuries. Factual information on drug abuse can save lives—a public service message. "They said sniffing glue was no big deal... They lied." Chronic inhalant abuse can lead to the permanent loss of the ability to perform everyday functions like walking, talking and thinking. Factual information on drug abuse can save lives—a public service message. "They said half a hit of 'E' would be fun... They lied." 92 percent of those using Ecstasy later turn to other drugs including marijuana, amphetamines, cocaine and heroin. Factual information on drug abuse can save lives—a public service message. "They said LSD would help me forget my problems... They lied." LSD is the most powerful hallucinogenic (mind-altering) drug: 100 times more potent than psilocybin mushrooms and 4,000 times stronger than mescaline. Factual information on drug abuse can save lives—a public service message. "They said if I did coke, I could party all night... They lied." Cocaine increases the likelihood that the user will experience a heart attack, stroke, seizure or respiratory failure, any of which can result in sudden death. Factual information on drug abuse can save lives—a public service message. "He said he would love me forever if I smoked crack with him... He lied." In the United States, in a single year there were more than 42,000 emergency room visits in which crack was involved. Factual information on drug abuse can save lives—a public service message. "They said meth would help me get through my exams... They lied." Crystal Meth is highly addictive and can create a devastating dependence after just one hit. Factual information on drug abuse can save lives—a public service message. “They said one hit wouldn’t hurt... They lied.” In one year, more than 30 percent of students had been offered, sold or given illegal drugs on school property. Factual information on drug abuse can save lives—a public service message. 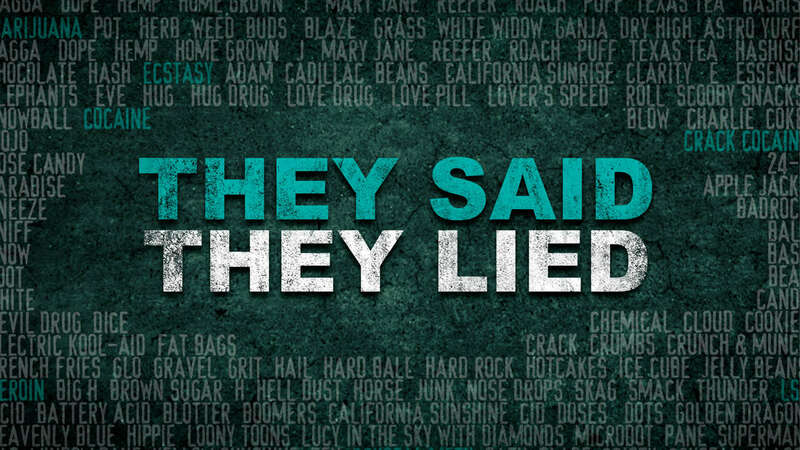 "They said... They lied." One-third of teens have gone to house parties where there was alcohol, pot, cocaine, ecstasy or prescription drugs present. Factual information on drug abuse can save lives—a public service message. Get your kids the truth about drugs: drugfreeworld.org. Factual information on drug abuse can save lives—a public service message.